Federico Santi and the Santi Family, The Balkwill Family of New York City. Francis Santi, son of Federico Santi, maitre d'hotel of Hotel Statler, Cleveland who for the past five years has been receiving an education in Europe, is enrolled this fall at the Swiss Hotel Professional School, Lausanne, where he plans to take a special kitchen course for four months. At the conclusion of this course, he will go to the Hotel Continental, in Paris, as apprentice in the kitchen of that famous hotel for a period of one year. His next stop in the hotel training will be London, in the dining room department of the Savoy. This will be followed by a period of training in the auditing department of a high-class hotel in Berlin, winding up as chef de reception, at the Excelsior, in Rome, for a short period. At the completion of his studies abroad, Mr. Santi will return to America where he will assume duties in the front part of the house of a first-class hotel. Miss Marcella Santi has been abroad with her brother for the same length of time, following him through the various European cities and specializing in the study of foreign languages and receiving a commercial training. Mrs Santi joined her children early this spring, and Mr. Santi plans to be united with his family next June when he will spend a few months vacation with them. Federico Santi has been maitre d'hotel at Cleveland Statler since 1920, coming at that time from the Hotel Pennsylvania, New York, which he opened as assistant maitre d'hotel. Mr. Santi is a speaker much in demand on the subject of Mussolini and Modern Italy as well as on his chosen line of work. Among the clubs of Greater Cleveland before which he has spoken recently are the Women's Club, Rotary, Shrine Luncheon Club, and the Men's Club and Women's League. He has also spoken before the Rotary and other clubs of Youngstown, Massilon and Canton. In a recent address he urged state schools for the training of hotel employees and strongly endorsed the methods and procedure at the Swiss Institution where boys take turns waiting upon each other under guidance of experts. Federico Santi was born in Grand Hotel Bellevue, Florence, Italy, owned and managed by his father. There he began his career at the age of 12 as a page boy. He has had experience in Germany, France, England, and Italy and Austria. He speaks four languages fluently. During the World's Fair in Rome, in 1911, he opened and managed the largest hotel on the exhibition grounds where he served all the royalty who came to Rome. Francesco Santi: Father of Federico and Alfredo Santi; born in Piancaldoli Italy May 10th 1848; Died in Rome Italy May 4, 1913. Maria Chirarina Santi: nee Macchiavelli; Mother of Federico and Alfredo Santi; born in Pian Del Volgio Italy (Tuscany); died in Florence Italy August 23rd 1896 at 11 a.m.
Alfredo Santi; son of Francesco and Maria Chiraina Santi; a brother of Federico Santi; born in Florence Italy June 30th 1884; died in Rome Italy December 28th 1904. Alfredo Santi: born in Rome, Italy. March 15, 1905. "Alfredo Santi is therfore a full legal brother of Federico Santi to all terms of Italian Laws sharing in equal part with Federico Santi to all property left by the late Francesco Santi, their Father." November 9th: wedding took place in New York City in the year 1911. Francesco and Marcella born at 945 6th Avenue, New York, NY. Issued in Philadelphia on March 25th 1919 under Signature of S.S. Daule, Deputy Clerk of District Court, United States Eastern District of Pennsylvania. 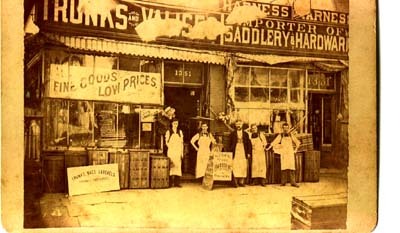 My Fathers Mothers family had a shop at 1351 Broadway in New York from about 1875 thorough the turn of the century. I guess that being a shopkeeper must be in my blood.